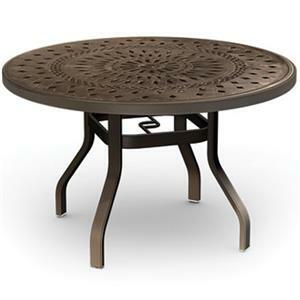 Gather your family and friends around this stylish cast aluminum table to for the ideal place to dine in your outdoor retreat. A handsomely designed top, splayed legs with a stretcher, and umbrella hole, this table is exactly what you have been looking for to host dinner parties in the sunshine. 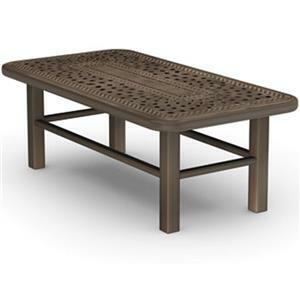 This table will pair perfectly with any outdoor chairs you choose to add to it. The Camden Cast Rectangular Dining Table with Splayed Legs by Homecrest at VanDrie Home Furnishings in the Cadillac, Traverse City, Big Rapids, Houghton Lake and Northern Michigan area. Product availability may vary. Contact us for the most current availability on this product. Perfectly designed for your outdoor space, transform your yard into the relaxing paradise you have always dreamed of when you add this Camden Cast collection. Splayed legs, block feet, umbrella hole, and intricately designed tops combine for a look that you are sure to love. Host summertime dinner parties in elegant style with this Camden Cast collection in your outdoor retreat. 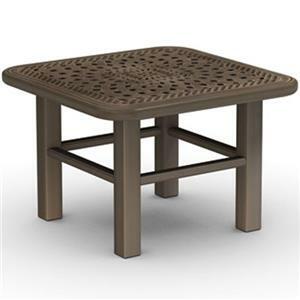 The Camden Cast collection is a great option if you are looking for Transitional Outdoor Furniture in the Cadillac, Traverse City, Big Rapids, Houghton Lake and Northern Michigan area. Browse other items in the Camden Cast collection from VanDrie Home Furnishings in the Cadillac, Traverse City, Big Rapids, Houghton Lake and Northern Michigan area.